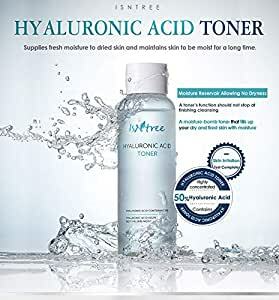 ISNTREE Hyaluronic Acid Toner is formulated mainly with Hyaluronic Acid 50%, Birch Sap, and Phyto Oligo to create a moisture barrier that deeply moisturizes your dehydrated skin and prevents from moisture loss for a long time. The toner is a very clear gel type liquid without much stickiness or greasiness. It is a refreshing toner that is suitable for all skin types, ideal for dry and sensitive skin types. 1. Use this toner as the first step of your skincare routine, after cleansing and before applying lotion. 2. Dispense onto palm or cotton pads and gently massage your skin as you are spreading it onto your face.